What do you need to raise funds effectively when you’re a new or relatively small organization? The first half of this workshop takes you back to the basics first, covering how to build a strong foundation for fundraising, and then covers fundraising specific to animal welfare, which differs from other nonprofit sectors. 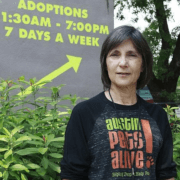 Real, practical examples of what has worked at Austin Pets Alive! will be covered, including from individual donations through online giving, e-solicits, direct mail and major gifts; grants; events; and support from businesses. The second half of the workshop will cover issues faced by organizations as they grow larger, diving deeper into the details of creating an overall funding strategy, building a strong grants program, and offering a more in-depth look at finding the right balance of fundraising activities according to the characteristics of your own community.